6th December; our two Adventures in Yellow books have been on release for four months and 2011, one of the most exciting years in our lives, will be drawing to a close. This time last year our attempt to break into the literary world had reached crisis point: the books were written but we simply could not attract a publisher. We’d sent out dozens of manuscripts, even tried sending self addressed envelopes to illicit some response, but drawn a complete blank. We were adrift in the dreadful doldrums of not knowing if we were sitting with an undiscovered best-seller or had just spent a year writing something that amounted to mere “chloroform in print” to quote Mr Twain. The bright light that had been our journey was starting to extinguish. The best stories had all been passed around to those with a ready ear and were fading to fossils, buried under strata of more modern experiences mostly to do with the daily tedium of house and home, career and work. Then the breakthrough; a weekday afternoon phone-call to Grace at Indepenpress, a lovely lady who finally granted me some of her time to explain the story and then kindly offered to have the manuscript reviewed: six weeks later an offer to publish. The release of the two books has been a volcanic eruption. The fossils are free and I’m glad to report they are running amok in our life once again. Having the books published was only the start of this new adventure and significant challenges lay ahead. 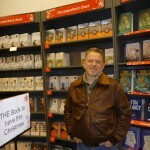 Our heady elation at getting the books into print was deservedly deflated by Steve Chilton at Waterstone’s, St Albans, who injected us with a dose of healthy realism: it was unlikely that any bookstore would stock our books for the same reason that we’d had difficulty in attracting a publisher. We were not famous; nobody knew who we were or what we had done. In business terms we had to address the old law of supply and demand. We were primed and ready to supply but as yet there was no demand. This is where Maggie stepped in, becoming a full-time literary agent on a mission to get ‘Adventures in Yellow’ into bookstores the length and breadth of the country. As part of this campaign we decided to organise a series of Saturday book-signings. Steve at St Albans rewarded Maggie’s enthusiasm by granting us our first date and it proved such a runaway success that doors were sprung for subsequent signings at other bookstores. 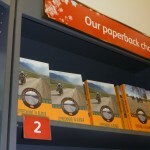 Our reception in the stores has been superb, from the shock effect on people’s faces as they wander in to their local bookstore to see a monster motorcycle, then their patience in listening to our short synopsis followed by a usual willingness to read the adventure for themselves and hopefully find some inspiration from our tale. One definition of ‘travel’ is to take yourself to strange places you wouldn’t normally go and interact with strangers you’d normally never come across in a routine life. We have had this every weekend for the past fourteen weeks, happily exchanging Peru for Peterborough, Bolivia for Bedford and Nicaragua for Northampton. We’d both like to send our heartfelt thanks to the good citizens, bookstore managers and staff of St Albans, Stevenage, Hitchin, Letchworth, Milton Keynes, Bedford, Northampton, Bury St Edmunds, Peterborough, Manchester (Trafford Centre), Finchley Road, Hatfield and Enfield for having us and for the enthusiastic support you’ve given us throughout this stage of our journey. An other important element of Adventures in Yellow is our website and for this we owe a great big thanks to Iain Harper at Heartwood Digital for all his patience and magnificent effort in rejuvenating and maintaining panamericanadventure.com through the year. And so to end this piece and this year with some fantastic news… On Saturday 3rd December we were informed that ‘Adventures in Yellow’ has made it into the bookstore charts in Waterstone’s Hatfield branch… At NUMBER 2!!! !